Photos and video taken at studio activities, including music lessons, group classes, field trips, and social events. We perform at a neigbhourhood nursing home before Christmas. It's a great experience for the students and a great opportunity to connect with the older generation. Credit: Rhona-Mae Arca. Two of my students perform O Come All Ye Faithful for the residents at a neighbourhood nursing home. Credit: Rhona-Mae Arca. Two students took turns performing one verse of a Christmas song. Credit: Rhona-Mae Arca. My students had fun jamming at the National Music Centre. Credit: Rhona-Mae Arca. My students enjoyed trying out various pianos at the National Music Centre. Credit: Rhona-Mae Arca. Looking up from the NMC lobby. Credit: Rhona-Mae Arca. Fluxx: The students love this card game with ever-changing rules. Credit: Rhona-Mae Arca. Some of the tabletop games my students enjoy at our piano parties. Credit: Rhona-Mae Arca. The students students were challenged to come up with different ways to subdivide beats. Credit: Rhona-Mae Arca. Using LEGO® to show the intervallic relationships between the pitches in a scale. Credit: Rhona-Mae Arca. Dungeon Hunters Perform "Dr. Who Theme"
Dungeon Hunters performed the Dr. Who Theme at the 2015 Spring Recital. Destiny performed Outside at the 2015 Spring Recital. Credit: Rhona-Mae Arca. Students learned that timing is different in martial arts, and that changing it up can save your life. Credit: Rhona-Mae Arca. At the Movement Group Class, the students tried their hand at Jodo, the Japanese art of the short staff. Credit: Rhona-Mae Arca. At the Movement Group Class, my students learned a couple of folk dances and tried some martial arts. Credit: Rhona-Mae Arca. Maestro approved of Tanya's run-through by singing along. Credit: Rhona-Mae Arca. Celia practises the Treats Drill on one of her pieces. Credit: Rhona-Mae Arca. Erika performs at the studio Halloween Piano Party. Credit: Rhona-Mae Arca. Some practice ideas based on how much time you have to practice. Credit: Rhona-Mae Arca. Rhona-Mae shared the practice plans she utilized when she was in school. Credit: Rhona-Mae Arca. Maestro was proud to show off one of his fave hangouts to "his" students. Credit: Rhona-Mae Arca. Michael Lipnicki (Michael Lipnicki Fine Pianos) presented two interactive workshops to help us understand how the piano works. Credit: Rhona-Mae Arca. Evan's LEGO® Piano remains a popular fixture in the studio, years after construction. Credit: Rhona-Mae Arca. Maestro was the first studio spokesdog to see the Kuniisii Steinway piano. Credit: Rhona-Mae Arca. The Top Dogs for Goals Met, Minutes Practiced, Most Gigs, Music Mastery, and Music Moxie. Credit: Christine Kohl. Six students (one not shown) participated in Eric Whitacre's Virtual Choir 4.0: Fly to Paradise. Recording set-up for VC4. Credit: Rhona-Mae Arca. Dylan and I show off a multi-camera set-up in the music studio. Lauren, Maestro and I pose for a photo used in a Suite101.com interview in 2010. Credit: Christine Kohl. Photos and videos of Rhona-Mae's performances and presentations. 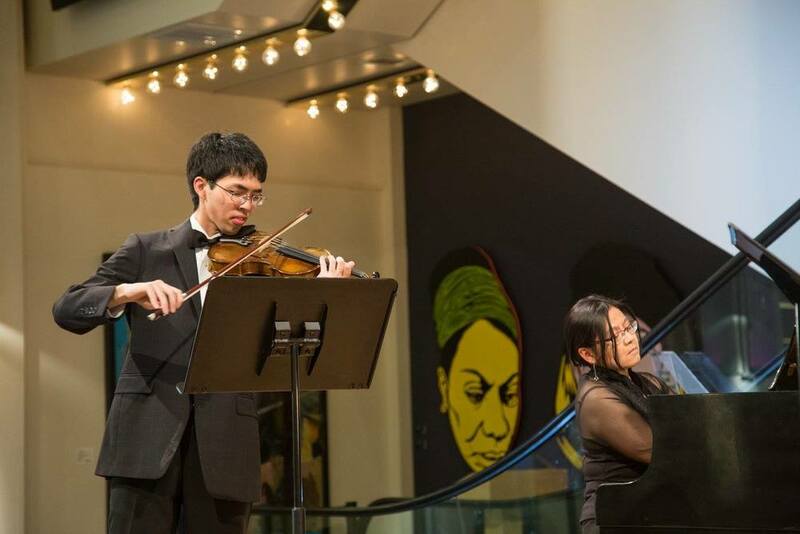 Performing Kimi no Kioku and Eyes on Me at the 2015 Calgary Omatsuri with Bryan Roces. Credit: Christine Kohl. Rhona-Mae presented a session on collaborative technology in the studio at the 2015 Canadian Federation of Music Teachers' Associations national convention in Vancouver. Credit: Noreen Wensley. Most of the music teachers from Alberta who attended the 2015 CFMTA Convention in Vancouver, BC. Credit: Noreen Wensley. With the 2015 Tech Teachers and sponsors (L-R): Doug McGarry (Roland Canada), Karen King, Rhona-Mae Arca, Linda Gould, and Derek Oger (Conservatory Canada). Credit: Dorothea Johanson. Kimi no Kioku (Memories of You) Cover with Bryan Roces, Jay-Arnel Arca & Rhona-Mae Arca. Credit: Christine Kohl. The High River United Church Choir, Good Shepherd Choir, St. Benedict's Choir and St. Francis de Sales Choir joined forces under the direction of Reverend David Robertson to sing "African Noel" arranged by Benjamin Harlan. Piano: Carrie. Percussion: Rhona-Mae Arca & John Wiest. Posing with the Tech Teacher of the Year sponsors (L-R): Doug McGarry (Roland Canada), Rhona-Mae Arca, Olivia Riddell (Music for Young Children), and Victoria Warwick (Conservatory Canada). Credit: Jay Gough. In July 2013, Rhona-Mae was named the inaugural Tech Teacher of the Year by Roland Canada, Conservatory Canada, and Music for Young Children. Credit: Melodie Archer. In 2012, 10 members of Eric Whitacre's Virtual Choir gathered in Vancouver, BC to attend Eric's concert with the Vancouver Chamber Singers. It was an honour for the group to meet Eric for dinner. One of my performances at my studio's cafe showcase on February, 1, 2014 at Caffe Crema: Metamorphosis Three by Philip Glass. I didn't do all the repeats. 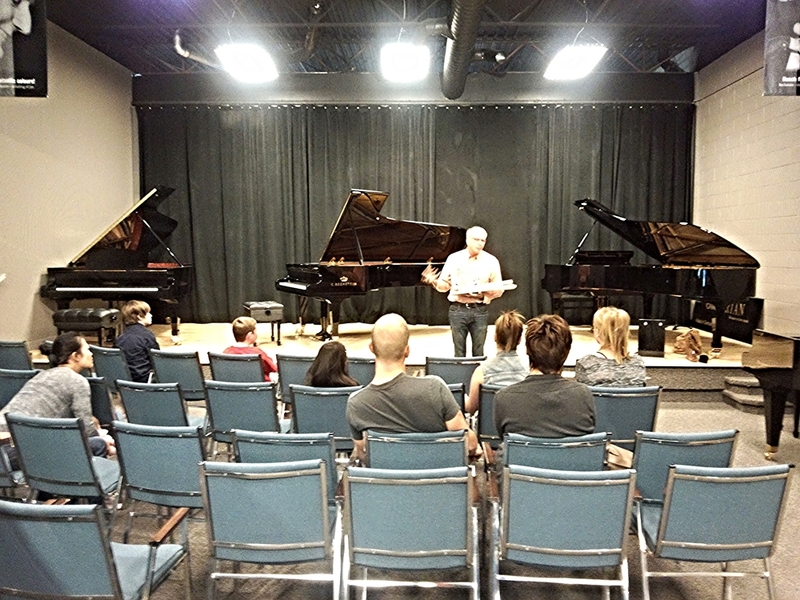 Musespeak Studio Winter 2012 Recital. All Saints Lutheran Church. Pia no Jac's jazz-rock version of "Habanera" from Georges Bizet's opera Carmen. Performed 2011 High River United Church. Rhona-Mae Arca (piano), Jay-Arnel Arca (cajón). Pia no Jac is a piano/cajon duo from Japan. Their music is a jazz/rock/classical fusion - right up our alley. Performed at High River United Church, featuring Jay-Arnel Arca on piano and Rhona-Mae Arca on cajon. Arranged by arranged by David Hamilton. Gloria adapted from an arrangement by Ron Huff. Lux Venit Words and Music by Amy Grant, Beverly Darnell & Michael W. SmithOkotoks Alliance Church Choir directed by Tim Korthius. December 2009. Rhona-Mae's performance at Sherry Kennedy's "Singer in a Band" workshop July 2010 in Calgary, Alberta Canada. Derek Stoll (keyboards), Dave Hamilton (guitar), Dave Marshall (drums). 2010 Gift of Music Recital in High River, Alberta, Canada. Played on the fabulous Yamaha Grand piano at the High River United Church. Rhona-Mae performed with violinist Osmond Chiu and flautist Lucie Alaimo in a local independent film to be released later this year. Performing Doppler's Andante for a scene in a local film project.